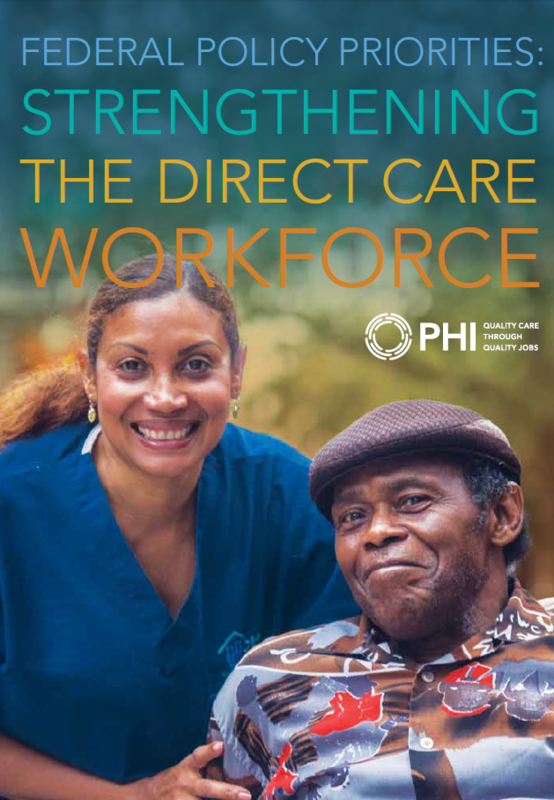 We work with federal leaders to center the direct care workforce in discussions on health care and the economy. At the federal level, PHI has collaborated successfully on bipartisan initiatives for decades. The typical home care worker makes $10 an hour, works part-time and irregular hours, and relies on public benefits to remain financially secure. These workers are part of the fastest-growing occupation in the country, whose growth is spurred by a rapidly aging America. Yet too often, they leave their jobs—and the entire sector—soon after they start. Our country must improve the wages, benefits, training, and career opportunities for these workers if we are to recruit and retain a skilled, compassionate workforce. The quality of care we receive depends on the quality of jobs for people who provide that care. A federal investment in this workforce is also an investment in economic development. Direct care will create more new jobs than any other occupation in the next 10 years. Additionally, direct care workers can ease the severe financial and psychological burdens of more than 40 million family caregivers, especially in rural areas. Family caregiving incurs enormous annual costs–nearly $7,000 a year in out-of-pocket costs for the average caregiver and nearly $12,000 a year on average for long-distance caregivers, according to 2016 research from AARP. Policy reforms that support direct care workers and family caregivers can have a significant financial impact on families and our economy. Federal lawmakers should enforce wage and overtime protections for this workforce and expand family leave. Federal lawmakers should adopt training standards for personal care aides and fund training interventions and opportunities. Federal lawmakers should work with states to gather data on staffing, turnover, vacancies, wages, income, and benefits. Federal lawmakers should strengthen Medicaid and promote culturally appropriate training and services. Federal lawmakers should support initiatives that improve care management among home care workers, their clients & families.